Still wasting time creating markups to sheets by hand? Don’t be so old fashioned. Ditch the old pen and instantly share markups with your team so everyone is clear on the issues. 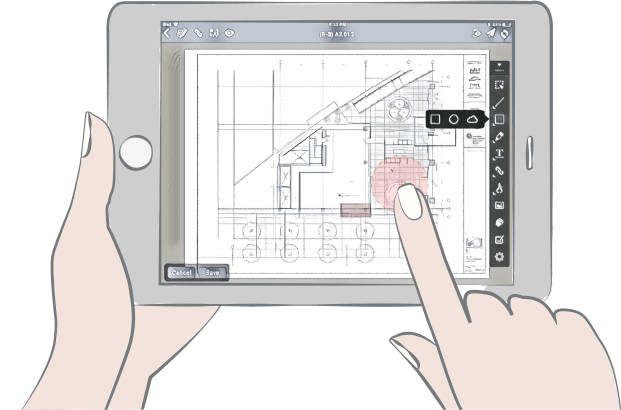 Choose your tool, the location on your drawing, and boom, you’re saving time with markups. No Wi-Fi? No problem, you can add or remove your markups on the go, right in the app. Just sync once you’re back online. Make assignments and notes, call attention to issues, add measurements. Provide specifics with links to photos and other docs. Create a punch or RFI. Add a note or callout. Link to photos and docs. Draw lines, arrows and shapes. View previous markups while creating new ones. Collapse the toolbar for unhindered viewing. Estimate measurements directly from your tablet. Highlight important areas or notes a focal point.